I’m going to share a little secret. I don’t particularly enjoy discussing compensation. There. I said it. I’m a veteran recruiter, talking to candidates and hiring managers all day, every day, about job opportunities and compensation requirements. And if there’s one particular aspect of my job that I would enjoy kicking to the curb, this would be near the top of the list. I’m curious to hear other’s opinions on this subject, as there are so many out there. There’s the camp of professionals who believe one’s current compensation is irrelevant when being considered for a new role. What if this candidate is being grossly underpaid? If the new position the candidate is interviewing for requires very different skillsets than their current role, is it a fair comparison? If a candidate’s experience and skills are particularly unique in the marketplace, can one even put a projected “price tag” on them? I don’t have the answers to these questions. I’m thinking out loud and asking all of you to join me. Another school of thought surrounds the notion of needing to have a sort of baseline to work from when considering an appropriate compensation package. In my role as a recruiter, I always ask candidates to explain their current compensation structure. I ask LOTS of questions! This comes from a place of genuinely wanting to get to know my candidate, to understand what type of opportunity is going to fulfill them, to fill those gaps they might be experiencing in their current position. It’s not common practice for me to provide specific compensation information to my clients when discussing a particular candidate’s salary requirements. When I present the candidate to a hiring manager, I provide a minimum compensation requirement (which I confirm with the candidate before submission). If a hiring manager pushes for very detailed information on a candidate’s current compensation package, it gives me pause. Assuming this candidate meets the requirements for the position, why is their current salary so important to understand? Fortunately for me, most of the hiring managers I’m partnering with do NOT push hard on this issue. I believe they trust that I am working hard for them and presenting the candidates whom I think are the best fit for their internal staffing needs. Candidates – If you’re getting pushed by a hiring manager to provide specific compensation information and this doesn’t sit right with you, it may be an indicator that this isn’t the right culture fit, plain and simple. It is okay to set boundaries. Focus on communicating your minimum compensation requirements. Remind the hiring manager that this is a multi-faceted question. If a hiring manager can’t accept that you’re unwilling to provide this information, move on. Hiring managers – If you’ve historically gathered compensation information from candidates as part of your interview process, perhaps it’s time to re-evaluate that approach. Why is this information so important? Maybe it’s just a standard question you’ve always incorporated into your interviews. But just because it’s been standard practice up to this point doesn’t mean it’s BEST practice moving forward. Pushing candidates hard on this may be unintentionally sending a message to prospective hires…and this could result in a negative perception of your organization. Soon, this question may very well become illegal to ask in the state of Nebraska. Some cities and states have already passed legislation prohibiting employer questions about a candidate’s salary history. I’m not pretending to have all the answers here, but I think this is such a meaningful conversation to have and to explore all viewpoints. I hope employers base their offers on the skills and professional experience a candidate brings with them and that all parties have a good understanding of competitive market value in their respective niche. Stephanie has been with Aureus Group for 13 years. As a Senior Account Manager within the finance and accounting division, she enjoys partnering with organizations across Nebraska, providing staffing solutions within the areas of accounting, finance, and human resources. In addition to working closely with hiring managers who are trying to identify talent for their departments, Stephanie finds great satisfaction serving as a confidential resource for professionals who are interested in exploring new job opportunities. 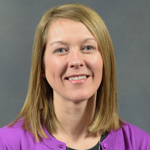 Stephanie has a bachelor’s degree in communication studies from Nebraska Wesleyan University and a master’s degree in negotiation and dispute resolution from Creighton University. In her free time, she enjoys spending time with her husband, Chad, and their three little girls, Charlotte, Willa, and Cecelia. Some of her hobbies include running, going on family vacations, and attending sporting events. Stephanie feels very fortunate to have found a career that is always presenting her with new, exciting challenges, professional growth, and learning opportunities.